Our contract training programs contribute to the entire spectrum of public and community safety from prevention to response to recovery. Every day, organizations and communities benefit from the education and training that their managers, employees and volunteers receive from JIBC. Delivered online or on-site, people are taught by experienced instructors on the front lines of their profession, gaining the knowledge, skills and competence to fulfill their vital public safety roles. JIBC’s continued success in providing contract and customized training is based on applying the latest research and technology in our courses, and employing a collaborative approach with our partners and clients. 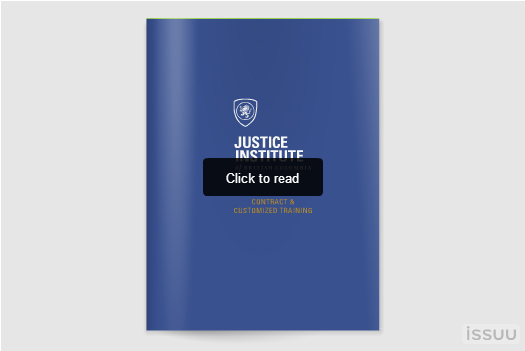 Review our contract and customized training brochure for more information, or contact us at info@jibc.ca. Click image to read in interactive format.